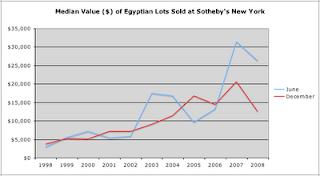 I have been doing some further analysis of the Egyptian lots in the sales of antiquities at Sotheby's New York. While the median has been increasing steadily since 1998, both sales in 2008 showed a downturn. There have been drops before, but it does look as if the present financial crisis is having an impact on sales.